In the harsh rivalry for smartphones market leadership Google and Apple have both announced forthcoming introductions of their new 3D mapping services. By this 3D step the search engine giant tries to strengthen its present market share while the latter plans to banish Google Maps completely from its iDevices. Who'll win this battle in the end? At a press conference on June 6th Google announced that its Google Maps service will soon feature much better 3D maps. The improved mapping services will be more real-life, genuine 3D thanks to new rendering techniques. The 3D imagery will be also more photo-realistic, because it will be no longer taken by Google cars and trikes, but by planes. The special Google planes will be equipped with imaging gear that makes possible getting an image of every possible angle of a house. But before Google had time to spread the word about its forthcoming innovative 3D Maps, Apple has already stepped into the territory. At WWDC yesterday, June 11th, 2012 the world famous manufacturer of consumer electronics has previewed its latest iOS 6, that has new Map app with … photo-realistic, interactive 3D views from the air attribute! The feature is called "Flyover" and makes possible exploring "cities in high resolution as you zoom, pan, tilt, and rotate aound the city and its landmarks"
With such a rapid response from its biggest rival Google will surely suffer some losses. 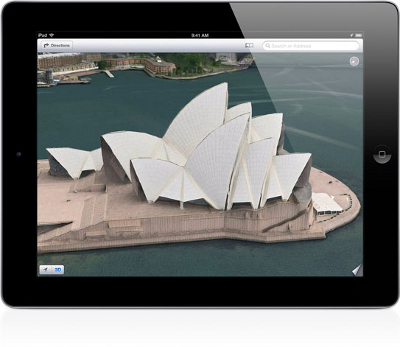 But the main question remains open: will it stand up to Apple's 3D mapping service? What do you think? Enjoy favorite videos and movies in 3D format using great 3D Video Converter! Put on anaglyph red-cyan 3D glasses and watch 'converted to 3D' video in magnificent 3D on PC, TV, iPod, iPhone, other devices. Try out 3D Video Converter for free to experience 3D effect in your movie! Enable 3D mode while watching regular 2D movie on-the-go in fantastic 3D Video Player. Click 3D button and watch your movie in red cyan 3D - download free 3D Video Player and try it out yourself now! Attention: Video to 3D Converter and 3D Video Player can't be used to convert, rip and edit copyrighted DVDs and videos.